Delta News & Review: Fishing Week 4/24/2014 Shout Out! Fishing Week 4/24/2014 Shout Out! This past full moon has surely brought a lot of bass up to spawn. Look for clearings in the weeds where the bass have cleaned out for spawning and toss Senko’s in those clearings and hang on. Remember, if you can see the fish it can see you. For those that like to toss crank baits, you can’t go wrong with a Lucky Craft Spring Craw Big Daddy Strike 3. It swims at the perfect depth and is a great bait for this time of the year. There is also a good top water bite on weedless frogs as there are bass guarding their fry all over the Delta right now. Trout fishing is still pretty slow on the lake right now. There are signs of Kokanee being caught but they are far and few right now. Once the weather warms a bit more the Kokanee bite should drastically improve. Right now there are just not enough of them being caught to get too excited about. Bass fishing continues to be good as a lot of bass are up shallow spawning or defending their fry. Pretty much everything is working right now. Anglers targeting trophy bass are still tossing large swim baits around main lake points. King Salmon and Rainbow Trout are biting right now on the lake. The bite isn’t wide open but it’s definitely improving. Anglers targeting trout and salmon are fishing as deep as 35 feet while rolling shad or using spinners tipped with night crawlers. 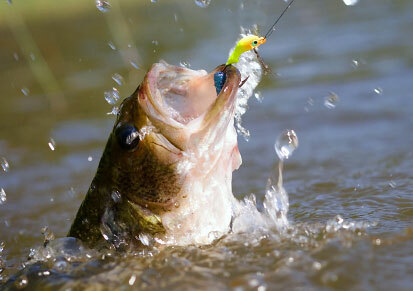 Bass fishing is great right now as there are plenty of fish to be caught up shallow. You can either bed fish for them right now or work small plastics from the bank down to 20 feet deep. There is also an improving popper bite for those top water enthusiasts out there. Trout fishing is good on the lake and in the ponds right now. Anglers fishing the lake are trolling around the dam areas and around Hat Creek. Bass fishing is good right now as anglers are reporting a good top water bite. The bass are surely on their beds right now making them susceptible to any slow moving bait. Lake Amador continues to be planted weekly with large trout. Anglers are catching them both off the bank and while trolling. For those fishing off the bank most of the bites are coming early in the day. Anglers fishing off the bank are using Power Baits Mouse Tails and those trolling are trolling Rapalas.